There I was sitting on my perfect gate with very little traffic, decent internet, close to town, and an address of its own that UPS could deliver to. Except for the constant struggle with the bad water pump on the support trailer, I was happy thinking about my upcoming vacation in just a few days and getting a lot of work done on a new website. Then it happened. The phone rang. It was my support guy who rarely calls me. “What’s up”, I asked. He needed me to swap gates with someone else because they weren’t happy about the lose ground they would need to park their Class A motorhome on for a new gate. With my 5th wheel considerably lighter, he thought I would have no problem there. What could I say. I wasn’t happy about the idea of moving but I want to work with this company for a long time and I managed to come up with a few things to be glad about. I was starting to get a bit bored after 3 weeks of almost no traffic. My body was getting out of shape again with the lack of daily exercise and letting me know it. Lastly, it would move me away from that horrid water pump. “I’m packing”, I said. Packing up after more than 3 months in one place always takes longer than expected. You tend to spread out in your space and forget how much effort it really takes to move on. It still went pretty smoothly. The couple and support guy came over before I was ready so they had to stand around and watch while I was loading and told them all they needed to know about that gate. Getting the half full sewer tank unhooked wasn’t a lot of fun for the support guy but he managed to do it without spilling. The one bummer was when I went to hitch up and the electric support jacks stopped dead. I figured it was just a fuse but was not familiar with where it was and in 100 degree weather with other people standing around, I wasn’t going to go looking too far for it. I pulled out the manual crank and we took turns cranking the RV up to back my truck under it. We were quickly getting overheated. With the trailer finally hitched, I pulled out of the way and checked tire pressures before hitting the road. One tire was too low so I had to drag out the air compressor to fill it. By the time all was ready, I was not feeling well at all and my whole head and face were hurting pretty bad even with drinking plenty of water. I sat in my truck just outside the gate and waited until I felt better before hitting the road. Following the directions I was given, I found the white brick wall and palm trees on FM 190 then found my new gate across the road. It’s a bit different as the fencing is low and the gate stays open all day per the rancher’s request. He lives across the street. 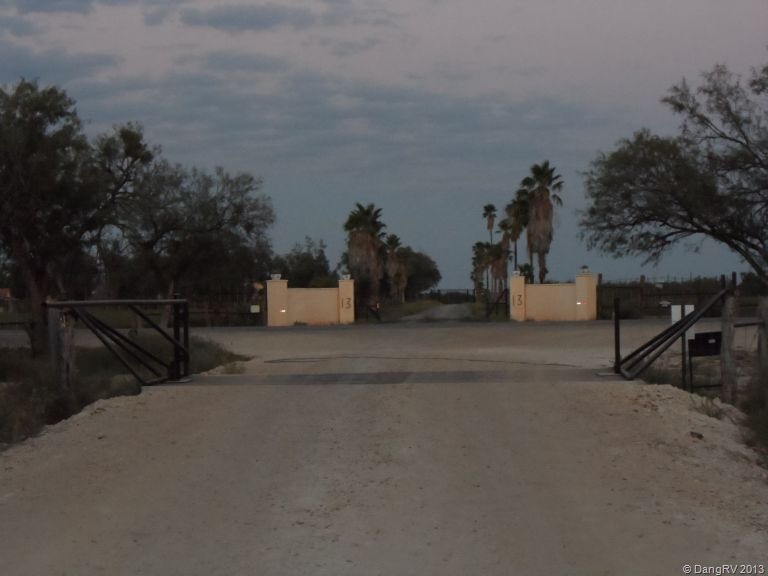 Not having to open the gate every time is nice though the security is not as good and they do get illegals on their ranch. The Border Patrol is very much present in this area. I pulled in, got the rig situated, and left it hitched up for the night since it was getting late and I was still overheated. The next day I cranked it off myself which was easier this time being on more level ground. Then I hunted down the blown fuse and replaced it. All was well. The internet in the area is total crap. The best I can get is 1xrtt on my Verizon phone. My Virgin Mobile USB stick isn’t working at all here for internet. Not happy about that. There are addresses across the road but I don’t see one on the gate to get deliveries at. I’ll have to check on that. Carrizo Springs is about 12-14 miles away now. Could be worse. I am next to a paved busy highway, I like the view of palm trees, and the rancher’s staff are very nice. Work starts on Monday but I leave on vacation on Sunday before it. Heh heh. The guy coming into cover me will get all the startup fun next week instead of me.